Nowadays, a computer is a part of our life. When we are using a computer, all kinds of questions may occur. For example virus attack, immediate power off, etc. Have you ever suffered a sudden failure of your computer? What would you do if you can’t access any of the onboard recoveries or repair options? How to fix the error? Windows has Pre-installation environment and recovery environment. If you can enter the environment, you are already the half success. However, Windows Pre-installation environment is difficult to use, but certain tools make the process dead simple. 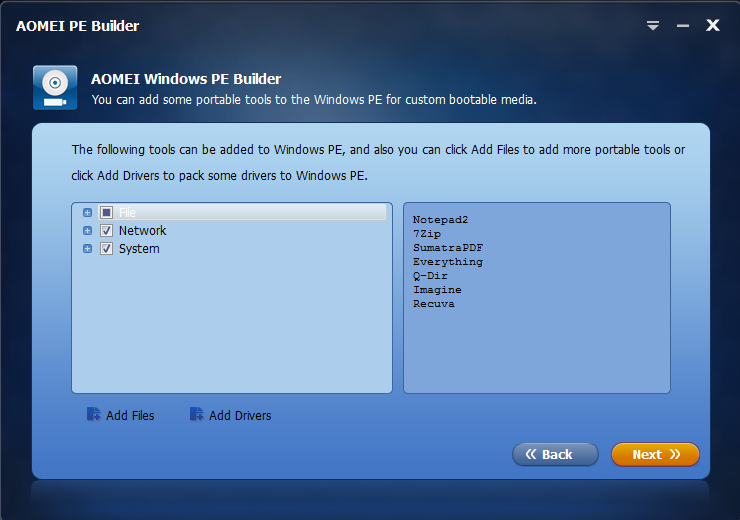 For instance, one can create a boot disc to perform troubleshooting tasks on an unbootable computer by using a free tool — AOMEI PE Builder. Windows Pre-installation Environment is WinPE for short, which is a special environment originally developed by Windows. Windows PE can be bootable environment or recovery environment. To create a Windows PE media, typically you have to pre-install Windows AIK or WAIK, or prepare a Windows installation disc. 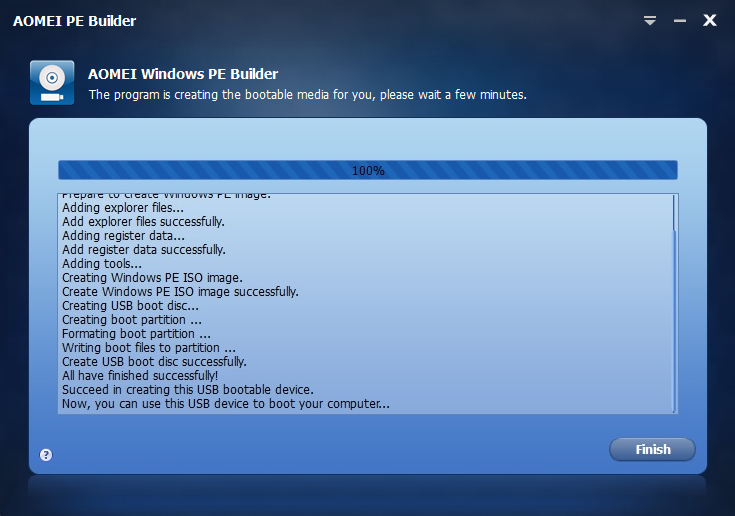 Luckily, AOMEI PE Builder allows you to create a WinPE media without installing AIK/WAIK. 1. Start AOMEI PE Builder and click “Next” in the first wizard page. 2. You can add tools and drivers which you frequently use here. There are four categories of program built-in common software: File, Network, Security and System. You can choose and include some of them to Windows PE portable programs. 3. When files and drivers are added, click “Next” to enter the interface on which you can select on what media to create Windows PE. There are three choices: Burn To CD/DVD, USB Boot Device, and Export ISO File. 5. Click Finish to close the window when the process finished. When the creation succeeds, you can restart your computer and adjust boot order to USB device to enter Windows PE system (you can enter BOIS to adjust boot order). AOMEI PE integrates desktop, Windows explorer, start menu, and taskbar into the WinPE environment; makes it easy and effortless for users to manage files and documents, just like using Windows operating system. 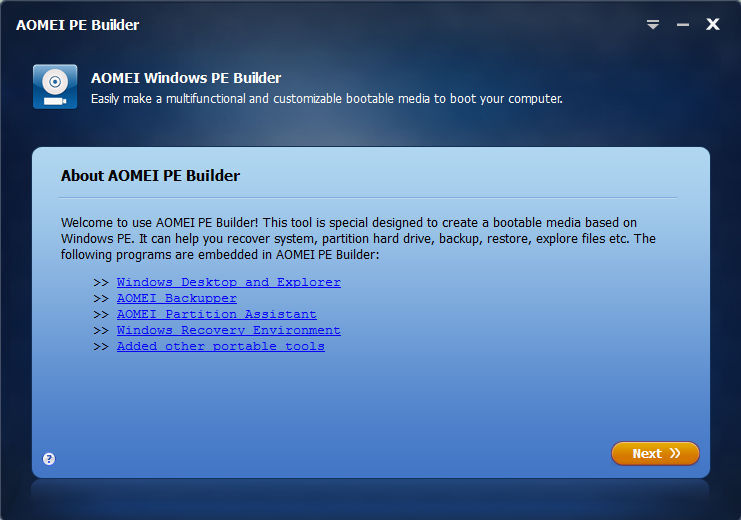 AOMEI PE Builder is a great freeware, with it, you are able to maintain your system better and make your life easier. It is much easier to use than original Windows PE, since you don’t need to install AIK/WAIK, and the environment has a familiar Windows environment. What’s more, AOMEI PE Builder integrates AOMEI’s partition software and backup program: AOMEI Partition Assistant Stand and AOMEI Backupper Standard. You can use them in the PE environment freely. 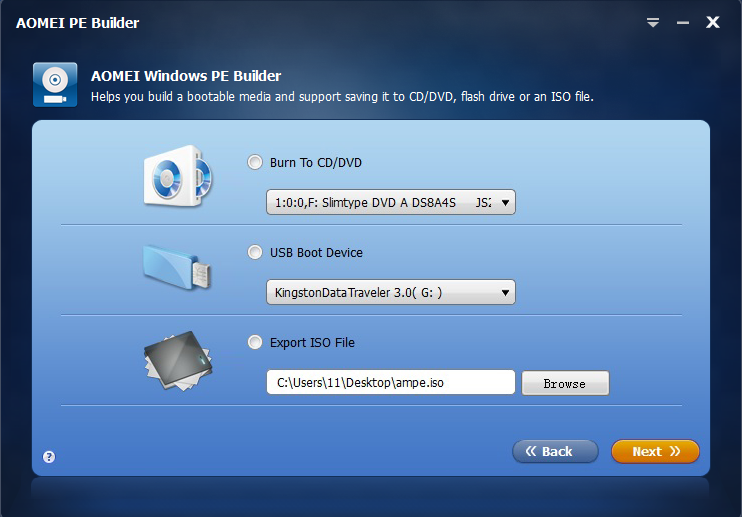 The PE builder tool itself requires Windows 7 or 8 to run, but any bootable media created should work with PCs running other versions of Windows too. Next story Samsung Galaxy C9 Pro Vs OnePlus 3T: Which 6GB RAM Phone is Better? Previous story How to Create a Factory Recovery Partition on Windows with AOMEI OneKey Recovery?